Henry Colin Campbell was a career criminal. On 23 February 1929 police found next to a motorway in Cranford, New Jersey, the burnt body of a woman who had been shot in the head. It was six weeks before the remains were identified as Mildred Mowry, a local woman, who had gone missing at the start of the month after joining a lonely hearts’ agency. Investigators discovered that in August 1928 Mildred had married 60-year-old Dr Richard Campbell who had disappeared to California with her life savings of $1,000. Her increasingly desperate letters went unanswered probably because “Dr Richard Campbell” was not in the Golden State but much closer to home in Elizabeth, New Jersey, where he was living with his real wife, Rosalie, and his family, under his true name Henry Cohn Campbell. When the lack of replies finally got to her, Mildred decided to look for her errant spouse. Then she vanished. The police finally tracked Cambell down on 11 April 1929 when he was arrested for murder. 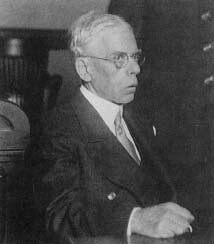 The murder trial of Henry Colin Campbell began at Elizabeth, New Jersey on 9 June 1929 before Judge Clarence E. Case. Two court-appointed psychologists Dr Gus Payne and Dr Lawrence Collins had examined Campbell and said that he was fit to stand trial despite an addiction to morphine. Campbell did not deny that he had shot Mildred Mowry with the 38 automatic found in his home or that he had burned her body afterwards. His defence was based on a claim of amnesia and he said that he had no memory of having done so. Prosecutor Abe J. David read Campbell’s confession in which he said he had murdered Miss Mowry to cover up his bigamous marriage but also put into evidence 17 letters written by Campbell to his victim. They showed how he had manipulated her, playing on her loneliness, and when she finally discovered where he was he murdered her. Judge Case summed up, “If the defendant was conscious of the nature of his act he cannot be acquitted. The law does not recognize that form of insanity in which the faculties are so affected as to render a person suffering from it unable to control those urges.” On 13 June the jury found Campbell guilty of murder and he was sentenced to death. On 17 April 1930 he was electrocuted.